I think you are either a list maker… or not. I’m a list maker and the most important list I make is my to-do list. 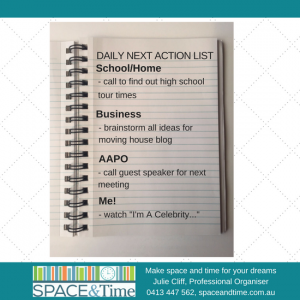 Let’s have a look at how the two lists work and the benefits of having a clear, concise next action list and a nice to do list. A daily next action list includes 2 – 3 “next actions” that you need to-do to move your project forward. The list can be written on anything and anywhere (diary, notebook, other formal to-do app). Breaking the to-do list down into next action makes all that you need to do more clear and concise. So instead of “write blog on moving house” the next action is “brainstorm ideas for moving house blog”. At the end of each day when I’ve crossed off some things from the list I review the list and reprioritise for the next day. Now that I have explained how the next action list works, we can examine the how the Master list works, and the benefits of keeping all the “nice to dos” in a separate list. The master list is a brain dumping list where you dot point all the things that would be nice to do at some stage. As with the daily next action list I keep a master list for each role I play in the community. Whenever something pops up that I would like to do, it goes on the Master list under that role eg: I find a great article about parenting I’d like to read, I jot down the details on the Master list under that role. Now days it’s very rare that I get distracted and jump in to that item and start doing straight away. It’s interesting to see how often, something you thought was so important on the Master list ends up being crossed off without wasting any time on it as it wasn’t really that important after all. What’s the value in getting this done? What’s the risk if I don’t? If today I could do only 3 or 4 tasks of value that will have a real impact, what would they be? Which of all priorities will give the highest payoff/make me money? Which of the projects does the boss consider most vital? What will happen if I don’t do the above projects today? Who will find out? Who will suffer? Which items in my previous days TO-DO list should I work on today? Does this take me closer to my goal? Does this lighten my mental load? Does this have to be done today? Have a go at keeping both these lists to see the benefits of having a brain dumping area and a clear concise next action list – I think you’ll be thrilled with the results! Need a hand managing your to-do lists or priorities have a look at my Time Management Services or Contact me today for a chat about how small regular changes can make a difference to your life. Mrs Secondhand buys secondhand furniture and other items. If you have secondhand furniture that you would like to sell then Mrs Secondhand may be interested. Get in touch with Mrs Secondhand today. The key to a functioning pantry is just the right amount of stuff and a place for everything. Many of my working Mum clients feel the same way: stressed and overwhelmed by having too much stuff and too much to do. Too often, as mums, we run from one activity to the next, day after day, week after week. This relentless pace leads to exhaustion. Take five minutes each week to plan your upcoming activities with intention, rather than continuing to run around in circles with no real direction. The process At the….